Almost all of them, if diagnosed and treated early, will be cured. If not, all three skin cancer types can be dangerous, disfiguring, and deadly. In a recent study, the development of non-melanoma type skin cancers in male mice exposed to UVB light was 50 percent lower in those fed a diet of 10 percent dehydrated tomato powder when compared to controls. The three most common skin cancer types are melanoma, basal cell carcinoma, and squamous cell carcinoma, and the number of Americans who get one or more forms continues to increase. Nearly half of Americans who live to be 65 will develop some type of skin cancer. Almost all of them, if diagnosed and treated early, will be cured. If not, all three skin cancer types can be dangerous, disfiguring, and deadly. Melanoma is the deadliest of all skin cancer types, yet the cure rate, with early detection and treatment, is 99 percent. Unfortunately, too many people delay treatment, even when they know they have a potentially life-threatening disease. The average age of people diagnosed with melanoma is 62, but it can begin at almost any age. The distinguishing characteristic of melanoma is uncontrolled growth of cells that produce melanin, which is one of the body’s coloring agents. Most melanomas have a black or blue-black color, and they appear abnormal, even ugly. A—Asymmetry. One-half of the lesion does not match the other half. B—Border. Ragged, notched, blurred, or otherwise irregular. C—Color. Not uniform and could include shades of brown, black, and tan, with streaks of red, white, or blue. D—Diameter. More than six millimeters (about one quarter-inch) when diagnosed, but possibly smaller. E—Evolving. Change in size, shape, color, or thickness, or beginning to itch, bleed, and form a crust. 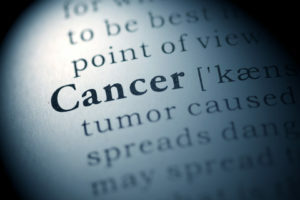 Discover information on the diagnosis and treatment of various types of cancer. Also, learn about preventitive measures you can take to stop recurrence. Claim your FREE copy, right now, of our definitive guide on cancer. 2: BCC is twice as common in men as in women. 4,000,000: Number of new BCC cases diagnosed each year in the U.S.
Basal cell carcinoma is the most common form of skin cancer. It is a non-melanoma form of the condition, and accounts for about 75 percent of all skin cancer cases. BCCs are slow-growing, painless, malignant tumors that develop in the lower part of the top layer of skin. They seldom spread, but if left untreated, they can affect surrounding areas and even move into bone tissue. Who is Susceptible to the Three Skin Cancer Types? People who spend a lot of time outdoors, those who are fair-skinned, and those who live in areas of the country where there is more sunlight per day. Others in the high-risk group are people with blue or green eyes, blond or red hair, and those who have been overexposed to X-rays and other forms of radiation. The main cause of BCC is exposure to sunlight. The areas of the body most likely to be affected are the face, ears, neck, scalp, and back. An open sore that bleeds, oozes, or crusts, remains open, and heals, then bleeds again. A reddish patch or irritated area. A shiny bump or nodule. Other signs to watch for include: an open sore that does not heal, irregularly shaped blood vessels in or around the spot, or a sore that has a depressed area in the middle. 1,000,000: The number of new BCC cases diagnosed each year in the U.S.
Squamous cell carcinoma (SCC) is uncontrolled growth of flat squamous cells located in the outer layer of skin. Middle-aged and older adults are more susceptible to SCC. Other risk factors are a fair complexion, frequent exposure to the sun, a history of working in the sun, early childhood overexposure to the sun, artificial tans from tanning beds, and living in an area of high-intensity sunlight. 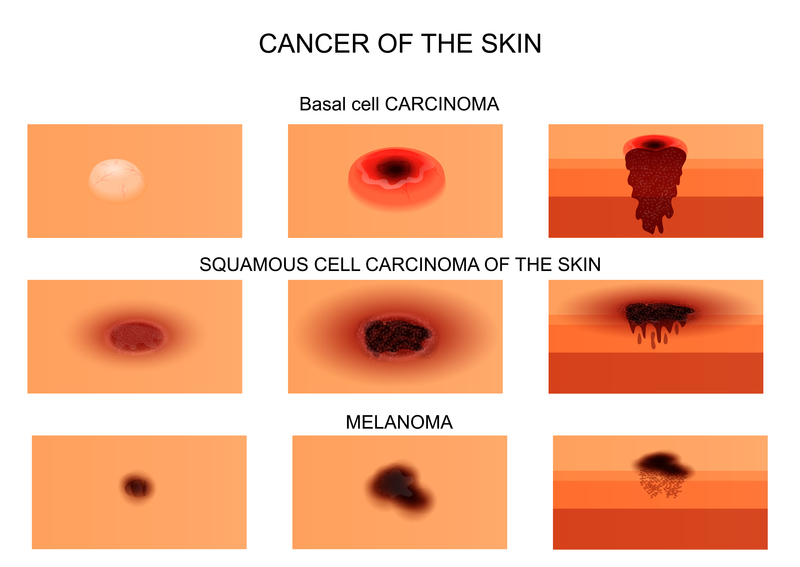 basal cell, basal cell carcinoma, bone, cancer, carcinoma, common skin cancer, depressed, ears, melanin, melanoma, melanoma skin cancer, melanomas, most common skin cancer, non melanoma skin cancer, pain, radiation, skin, skin cancer, skin cancer types, squamous cell, squamous cell carcinoma, squamous cells, tumor.